There is a story going on here, and it extends around the entire temple at Borobudur. What is most fascinating is that the reliefs shown above are incredibly well rendered and seem to include characters from global cultures. There are Europeans, Classical Greeks, Chinese, African, and Indonesian characters, all carved into rocks that are well over one thousand years old. They all reflect the story of Buddha, his birth, life, and transcendence. The Vespa is alive and well around here in Jakarta. This one? Not so much. Ever wanted a pig in your coffee? Well, this little pigguccino is just for you. This little coffee shop nearby, the Antipodean, is a wondrous little place where breakfast is served all day and the baristas are happy to show off their artistic talents for you every time you order a cappuccino. When we visited the volcano, Tangkuban Perahu, I managed to take some great shots of the people who work up there. Some of them knew I was photographing them, some of them didn’t. I would smile and nod and they would give me wonderful smiles back. I’m not sure that always meant they understood that I was photographing them. 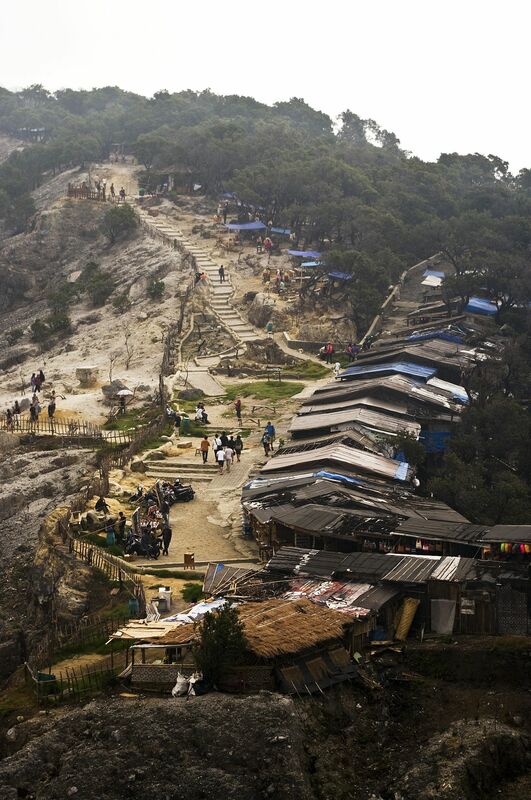 Tangkuban Perahu is an active volcano that is about a two hours’ drive from where I live. It is about 30km north of Bandung, and it is a hub for local merchants. The shot above is of all of the shops, both retail and food, that line the northernmost part of the trail. There are at least five times as many shops on the total site, but this shot offered the best vantage point of the shops and trail.